Workman Publishing Company, 9780761193036, 216pp. 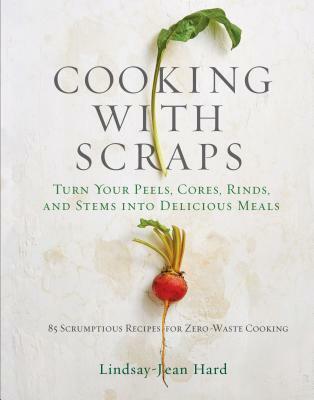 In 85 innovative recipes, Lindsay-Jean Hard—who writes the “Cooking with Scraps” column for Food52—shows just how delicious and surprising the all-too-often-discarded parts of food can be, transforming what might be considered trash into culinary treasure. Here’s how to put those seeds, stems, tops, rinds to good use for more delicious (and more frugal) cooking: Carrot greens—bright, fresh, and packed with flavor—make a zesty pesto. Water from canned beans behaves just like egg whites, perfect for vegan mayonnaise that even non-vegans will love. And serve broccoli stems olive-oil poached on lemony ricotta toast. It’s pure food genius, all the while critically reducing waste one dish at a time. Lindsay-Jean Hard received her Master's in Urban Planning from the University of Michigan. Her education and passion for sustainability went on to inform and inspire her work in the garden, home, and community. The seeds of this book were planted in her Food52 column of the same name. Today she works to share her passion for great food and great communities as a marketer at Zingerman's Bakehouse. She lives, writes, loves, and creates in Ann Arbor, Michigan.